Cadillac’s lineup will be overhauled in the coming years as the brand shifts its focus to SUVs and implements a new look loosely based on the stunning lines of 2016’s Escala concept. There are new models on the way like the XT4, CT5 and oft-rumored CT4 and XT6. Meanwhile, older models like the ATS, CTS and XTS are all on their way out. Others, like the CT6 and XT5, will be updated so that they blend in with the new arrivals. 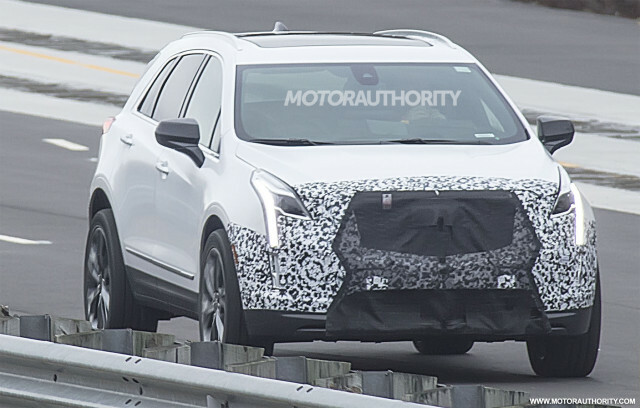 We’ve already spied prototypes for the updated CT6 and now we have our first spy shots for the updated XT5. The prototype is still at an early stage, though we can already tell the updated XT5 will feature new front and rear fascias and likely a revised grille more like the one on the Escala. We also hear that Cadillac will finally address one of the XT5’s main shortcomings: the lack of powertrain options. The XT5 is currently available with a 310-horsepower 3.6-liter V-6 only but this updated model is expected to offer a 2.0-liter turbocharged inline-4 as an option. Cadillac already offers the XT5 in China with a mild-hybrid system, though we haven’t heard anything about this option being offered in the United States. Similar technology features on the Buick LaCrosse sold here, so it’s not beyond the realms of possibility. It also isn’t clear what updates Cadillac has in store for the cabin. A safe bet is Cadillac updating the suite of electronic driver aids, including adding its Super Cruise partial self-driving system for highways. Right now the feature is only available on the CT6. Look for the updated XT5 to go on sale late next year, as a 2020 model.